That ever-so-popular canned soup lost it's appeal for me a long time ago. (Well maybe the noodles are still pretty tasty, but the rest leaves a lot to be desired.) There is hardly any flavor or nutritional value and the overload of sodium and preservatives keep me far away. My son, however, has had it before and he loves it. I don't blame him...what kid doesn't! It's kind of a right of passage when you're a kid, right? 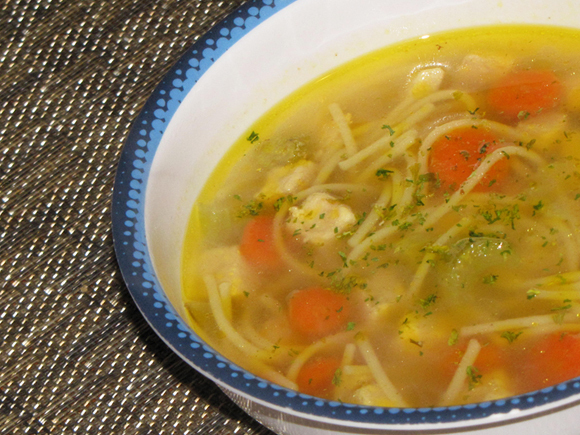 Because I'm all about using fresh ingredients when possible though, I've made my own version of the canned chicken noodle soup. Not only is it cheaper to make homemade, but the can has about two pieces of chicken and only three or four carrot pieces while mine has tons. In my opinion, vegetables are the best part of any soup! Fresh ingredients and loads of flavorful veggies make everything taste better. It doesn't take too much time to get this soup ready and it's one that you can feel good about giving to your kids. And if it's something my kid will eat and love (while being good for him), then I'm one happy mama! 1. Cook celery and carrot in 1 TB olive oil in saucepan over med- high heat for about 3 minutes, stirring frequently. 2. Chop chicken into small pieces and add to pan. Cook until browned. 3. Add noodles and stir to coat. 4. Next add all the seasonings and chicken stock. 5. Bring everything to a boil and cook for 5 minutes. 6. Lower heat to a simmer and cook until noodles are done.